Bathroom Partitions - Delivered Fast! 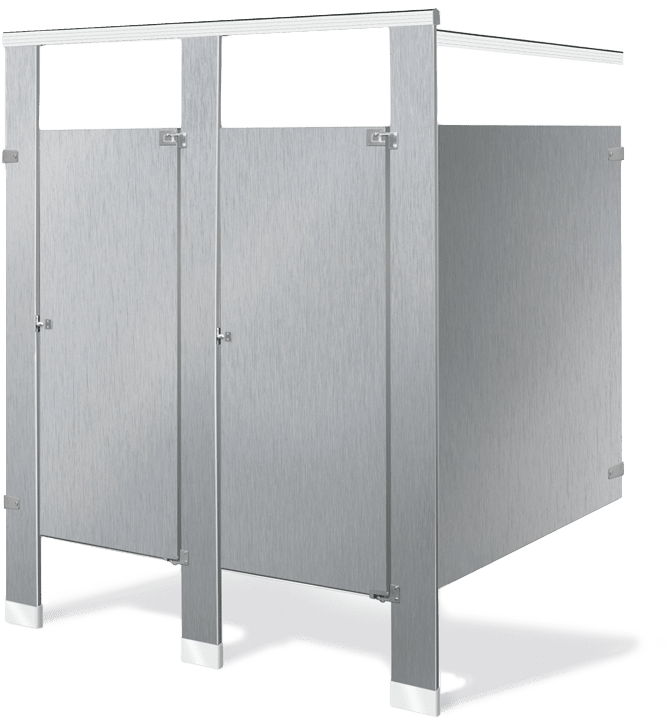 Powder coated steel toilet partitions are the industry standard and are the most popular choice for new construction or remodeling of restroom partitions due to their durable quality and economical pricing. The powder coated finish is electrostatically applied over galvannealed steel, which protects against corrosion and provides a proper base and adhesion for a durable and smooth powder coated finish. This surface is three times more resistant to humidity and salt spray than solvent based painted finishes and it is highly resistant to stains, scratching, scuffing, and corrosion. With a low noise level, powder coated metal toilet partitions are ideal for high traffic areas such as schools, churches, and libraries. The lightweight metal product provides for ease of installation. It is easily cleaned and is available in a large variety of colors to fit any new restroom construction or renovation. If you’re looking for the best bang for your buck, you’ve found it. A toilet partition product that provides high quality material and affordability, yet still looks and functions as wonderful as some of the most expensive and higher-end products. Stainless steel toilet partitions lend a feeling of luxury and a modern appearance to any commercial restroom environment where appearance and strength are prime considerations. The superior appearance of stainless steel toilet partitions has a sleek design that appeals to the eye and imparts a visual and glowing beauty unmatched by any other material. It is a virtually indestructible choice which combines the strength of #304 stainless steel with the gleaming beauty of a #4 satin finish. Stainless steel proves to be a wise selection for its ease of cleaning, durability, and resistance to humid conditions (the material will not rust). Dirt, grease and cosmetics are easily removed. Even scratches can be eliminated by buffing the finish and blending the surface. The material will not support smoke or flame spread and it promotes a hygienic environment. Stainless steel toilet partitions are recommended for any commercial toilet partition project in hospitality, casino’s, and retail installations. To ensure safe delivery, our stainless steel partitions are shipped with an industrial protective film, which can be removed during installation. The elegance of stainless steel toilet partitions complements any design scheme, whether in new construction or restroom renovations. If you’re looking to impress, then look no further. Stainless steel commercial toilet partitions are the right choice for your commercial project. Solid plastic toilet partitions are an ideal material choice for high traffic and vandalism-prone commercial restrooms where low maintenance and durability are a necessity. Solid plastic material is made from high density polyethylene resins and have homogeneous coloring through the material and smooth, machined edges. The lightly textured finish hides any effects of vandalism. Solid plastic toilet compartments are water resistant and unaffected by high humidity, making the material microbial resistant and therefore a sanitary choice. Solid plastic toilet partitions are graffiti resistant and will not dent, crack, chip, flake, or delaminate. Minor scratches can be successfully repaired due to a solid color throughout the material, and the partitions never need repainting. Solid plastic toilet partitions are ideal for any high foot traffic buildings, such as, schools, stadiums, office buildings, parks, airports, or any high-traffic washroom. If you are looking for professional looking yet low maintenance toilet partitions in a high-traffic commercial restroom, then solid plastic restroom partitions would be the most appropriate material selection for your commercial bathroom project.